Odessa Antique Show and SaleRecord Owner? Log in. Bill and his wife Linda continued to run the show until they sold it to Karen Leacock-Brown in 2011. 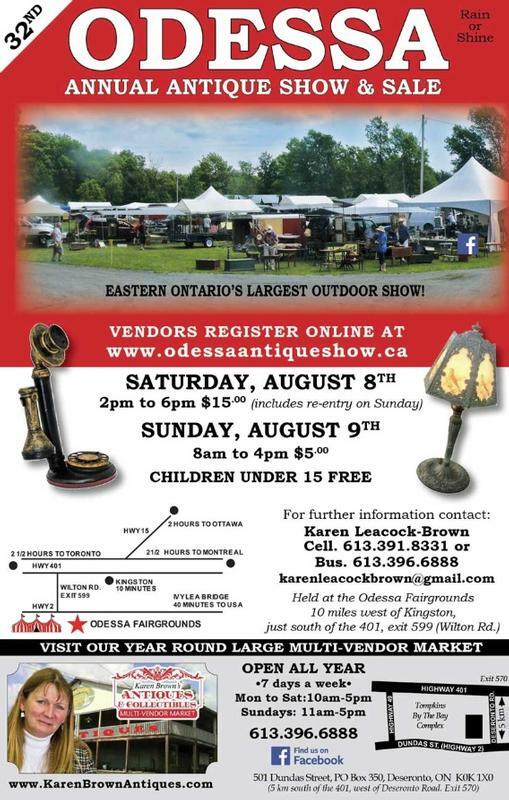 It is still the largest outdoor antique show in eastern Ontario with over 100 vendors. The show offers a good representation of antiques and Collectables including furniture, glass, china, advertising nostalgia, primitives, tools, toys, etc., etc. Virtually just about every type of antique and collectable there is can be found at the Odessa Antique Show. Have something to say about Odessa Antique Show and Sale?